The Spectra Candela III Traffic Signal Light Tester measures luminous intensity and light output degradation of Red, Yellow and Green LED signal modules in order to meet mandated minimum safety standards. Spectra Candela III Traffic Signal Light Tester Model 2000 is a versatile, precision, portable multiple channel Photometer/Radiometer. Its� specifically Custom Configuration allows unit for measuring luminous intensity, illuminance, luminance, irradiance, radiance, radiant energy, and many other special parameters. Specifically configured calibrated channels can also be used to measure luminous intensity [Candlepower in candelas (Cd)] of Red, Yellow, and green LED traffic signal modules and Photometric brightness Red, Yellow and Green Arrows (foot-lamberts/cd/m2). Calibration and indication of the proper readout unit is accomplished automatically when the switches are set and the proper accessories/attachments are installed. The TSL tester can measure luminous intensity of LED signal modules and photometric brightness of LED signal arrows. The measuring capability and sensitivity range of the instrument is given in Instrument Specifications. The transportation industry demands a portable, calibrated light meter (photometer) for field measurement of light output degradation of Light Emitting Diode (LED) traffic signal light emission. There are number of inherent problems with LEDs. One critical issue is degradation. Instead of burning out catastrophically, like the incandescent lamps they replace, LED lamp light output continuously degrades (dims) as a function of time and temperature. Rarely does an LED lamp exhibit complete burnout. As an example, the subtle, continuous decrease in light output of a red stoplight eventually results in impaired visibility, leading to a potential traffic safety hazard. Responding to industry requests, the Company introduced a Traffic Signal Light (TSL) field tester and currently has more than 300 systems in the field, including several units approved and purchased by California Department of Transportation (Caltrans) and other municipalities and states. Type: Hand held Photometer/Radiometer that can be used to measure luminous intensity, illuminance, luminance and many other special parameters. This instrument can be custom configured for your application. Technology: For highest accuracy and reliability the Tester utilizes advanced front-end electronics, Custom Sealed Hybrid circuitry, Multiple Range Linear Circuit controlled by embedded microcomputer and a custom liquid crystal display with backlit electroluminescent lamp. Light Sensor: Silicon Photovoltaic Detector. Sensitivity Range: With English calibration, Illuminance levels: 0.1 to 70,000 foot-candles; Luminance levels: 0.1 to 70,0000 foot-lamberts. With Metric (SI) calibration, Illuminance levels: 1 to 100,000 lux; Luminance levels: cd/m2. Luminous Intensity [(Candlepower in candelas (cd)]: The Tester is calibrated to measure traffic signal light modules Candlepower directly. Luminance: Photometric Brightness in foot-lamberts and cd/m2. 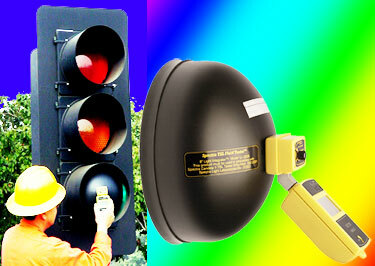 The Tester is calibrated to measure luminance directly of the traffic signal light modules "Arrow". The Memory Store and Recall functions are available on Models SK-TSL-2000 and BK-TSL-2000. You may store one measurement in memory by pressing the �STR� switch for later recording or tracking degradation. The advanced memory functions are available only on Model ST-TSL-2000. When Mode selection switch is activated and the Ratio or Average annunciator is displayed, you may recall the stored reading in memory-1 (M1), current reading in memory-2 (M2) and or the Ratio and Average of the two readings by pressing the �RCL� switch. Absolute Photometric Accuracy: � 5% of full scale (when measuring blackbody sources). Repeatability: � 1% of the full-scale on any range (at constant temperature). Power: One 6-volt silver oxide or lithium battery (Eveready 544,L544 or equivalents). * Operating Temperature Range: 32˚F to 130˚F (0˚C to 55˚C). CR-2000: The Cosine Receptor is specifically designed for cosine-corrected illuminance/ irradiance measurement. The specially designed white molded plastic diffuser receptor provides cosine correction to a high degree of refinements; thus the detector correctly evaluates the light level regardless of the direction. SA-2000-1: The Spot Attachment is a unique optical accessory that converts the Spectra Tester into a high- sensitivity 2� or 5� Spotmeter for narrow-angle reflected-light measurements. The Spot Attachment enables accurate luminance measurements of distant objects particularly useful for making accurate object contrast or ratio measurement. The Spot Attachment features a bright, erect, wide-field (12�), life-size optical system. A sharp reticle in the eyepiece accurately defines 2� or 5� measuring field. LR-2008 (4", 2", 1.5",.205"): The LED Receptors are accessories calibrated for LED and LED cluster measurement of axial luminous intensity (candlepower). The unit of measure is also called "candela". The full-scale sensitivity range of the Spectra Tester with LR-2008 is 0.1 to 100,000 candelas. The Receptor consists of a 12-inch long black aluminum anodized tube with an LED (LED cluster measurement) port on one end and a hemispherical shaped diffuser at the other end. The diffuser end attaches to the front of the Tester's detector head assembly. Other adapters can be provided for specific custom configuration. LA-2000-14: The Luminance Adapter modifies the angular response of the Tester to 14 degrees it is designed and calibrated to measure the surface luminance and radiance of LED clusters, back-lit sources or CRTs. The final readings are displayed in foot-lamberts or cd/m2. LI-20008 & LI 200012 Light Integrator: Light Integrator assembly is designed to measure LED intensity in order to keep track of LED degradation of the traffic signal modules. Light Integrator is geometrically shaped design (hemispheric shape). The inner side of the Light Integrator is white diffused Reflectance Standard material and an opaque diffuser assembly is attached on the front end. Light Integrator integrates and/or averages the effect of all the LED�s intensity and weighs them proportionally. Rear port of the Light Integrator attaches to the Spectra Candela�s detector head assembly. The front end of the Light Integrator fits flush against and totally covers the traffic light module to be measured. You may order Spectra Candela III TSL Model 2000 with the pre-selected and calibrated attachments and accessories for your particular applications. SK-TSL-2000 STARTER KIT: Spectra Candela III Tester; "Single channel", LI-20012- 12" (300mm), LI-2008- 8"(200mm) Light Integrator for (C1) Red, (C2) Yellow OR (C3) Green LED signal modules. Foam Lined carrying case. One year limited warranty. BK-TSL-2000 BASIC KIT : Spectra Candela III Tester; "Three Channel", LI-20012- 12" (300mm), LI-2008- 8"(200mm) Light Integrator for (C1) Red, (C2) Yellow AND (C3) Green LED signal modules. Foam Lined carrying case. One year limited warranty. ST-TSL-2000 STANDARD KIT : Spectra Candela III Tester; "Six Channel", LI-20012- 12" (300mm), LI-2008- 8"(200mm) Light Integrator for (C1) Red, (C2) Yellow AND (C3) Green LED signal modules, AND 12" (300 mm) Luminance Adapter for Red, Yellow AND Green LED signal ARROWS. Foam Lined carrying case. One year limited warranty. BK-TSL-2000 BASIC KIT : Spectra Candela III Tester; "Three Channel", LI-2008- 8"(200mm) Light Integrator for (C1) Red, (C2) Yellow AND (C3) Green LED signal modules. Foam Lined carrying case. One year limited warranty.